John and Jeff Winkle are twin brothers who grew up in Ludlow that have set up a fine arts studio in their hometown. The operation is a side interest from their main jobs. John owns a landscaping business and Jeff is a graphic designer. “We bought the studio as an opportunity to kind of put my graphic design studio in there and also we are going to collaborate on some art work and do some art together,” Jeff said. At Jeff and John Winkle Studio, the brothers create fine art through photography and graphic design. On the poster in the studio's window, the twins tout themselves as “Alike, but Different” which emphasizes their artistic common ground, but also their diverse skill sets. A lot of their art so far concentrates on abstract images of flowers. 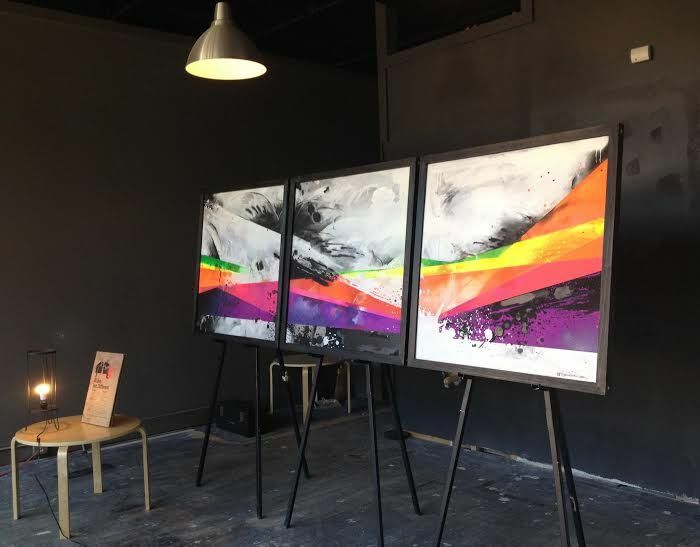 They have also done pictures of the Suspension Bridge and have recently created a three-panel piece of abstract design that features black and white photography mixed with a prism of added colors to create a bright, modern piece of art. The brothers have sold one piece so far and are encouraged by their start. They plan to showcase some of their pieces at the Ludlow Holiday Bizarre, scheduled for December 6 at the Ludlow Theater. The twins intend to have a small setup at the Bizarre and also plan on drinking a few cold ones in their nearby studio on Elm Street and encourage the public to stop by. Even though the brothers now live in different neighborhoods—Jeff in West Chester and John in Villa Hills—they like the idea of going back to Ludlow thanks to all of the exciting development opportunities going on in the community. Jeff and John's artwork and details about their new Ludlow studio can be found on their Facebook page.